Photos courtesy of the Center for Urban Resilience (CURes). Video courtesy of Shelby Roberts. Roberts said that she also felt sorry for the animal. It was during one of the heat waves that parched SoCal, and she thought that he might be thirsty. “It was about 100 degrees out, and I figured he was running around looking for some water,” Roberts said. Two camps of equally passionate and polarized feelings regarding urban coyotes exist in Long Beach as well as other communities. One extreme calls for hunting and killing the animals because of their perceived danger to pets, seniors and children, and the other advocates the need for coexistence by grace of the shrinking of their habitats through overbuilding. In between are people who love animals and shrink at the idea of killing a coyote; however, let one threaten a pet or a child, and all bets are off, as are the gloves. By nature, coyotes are diurnal, meaning that they’re active right after sunset and right before sunrise. But according to Ted Stevens, manager at City of Long Beach Animal Care Services (ACS), they’ve become more active at night in urban settings when fewer people are around. He added that on rare occasions, they’re spotted during the day. But a number of residents are increasingly reporting sightings during both daylight and darkness. Guidelines for dealing with urban coyotes are continually provided at community meetings and are accessible on social media. Methods include hazing, covering trash cans, and not leaving food outside—even the fallen fruit from trees (more complete guidelines concerning urban wildlife are provided on ACS’s Urban Wildlife page. Links are included for reporting coyotes and the Coyote Management Plan.) At an October 12 community meeting ACS manager Ted Stevens, California Fish and Game Senior Officer Kent Smirl and Dr. Eric Strauss, Executive Director of the Center for Urban Resilience (CURes), presented to over 130 residents an ongoing coyote assessment project developed by CURes. The study began in May; it represents an effort by the city to further study the phenomenon, gain more understanding of coyote behavior, and coming up with methods of addressing it and improving the City’s management plan. CURes is an educational, developmental and research group, operating within Loyola Marymount. Their website describes their focus as the improvement of quality of life in urban areas through development of projects “in diverse but related areas of ecology, biology, restorative justice and mediation, and sustainability.” Long Beach engaged in the partnership in response to years of reported coyote sightings and increasing nervousness about family pets and family members, such as the experience that Roberts described. The partnership is funded by a one-year grant from the City of Long Beach and has the potential to continue for three years. Through CUres’s research, the City hopes to gain more knowledge of urban wildlife, coyotes in particular, and create a management strategy plan that balances both public safety and protection of wildlife. At the beginning of the study, the team assessed coyote distribution data collected by local city wildlife officials.CURes staff and student researchers then placed 14 game cameras around the city to capture images of coyotes. Four months of data collection yielded nearly 30 hours of video footage and over 33,000 photos, 2,573 of which showed coyotes. Eight of the images had cats in them. “The cameras gave us a lot of information about how they survive, how many will stick around and how many will leave,” Stevens said. 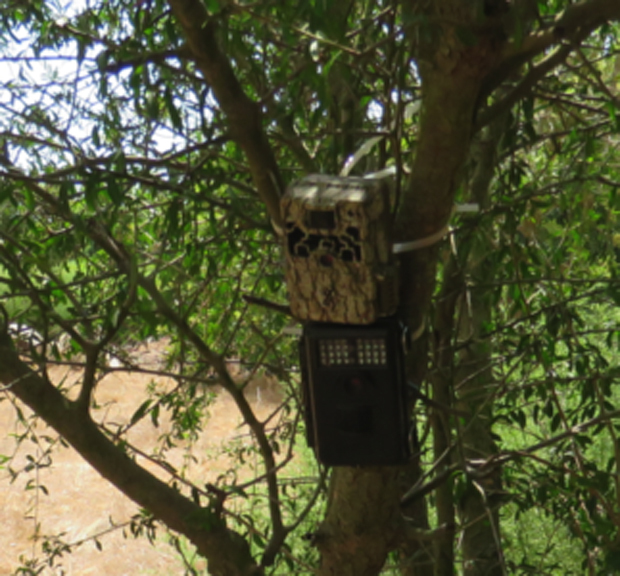 Game cameras such as this one are posted in strategic places to capture images of coyote behavior. The focus so far is on one family comprising a male, a female, and three offspring. The brood will continue to be studied to understand the dispersion of young males and the family structure before the study expands to other areas of the city. Stevens said that other game cameras will be placed based on sightings from the public. Based on the reports from the research team, the time stamps on the photos seemed to support coyotes being nocturnal. As the study progresses, the team will analyze coyote droppings to determine the exact food sources for this population. The ultimate goal is for data from the first year to provide the foundation for the next phase, which includes capture of animals and fitting them with GPS devices to further track them. During the three-year study, recommendations for public policy will continue to develop. Stevens is confident that the study’s results will yield information other than not leaving food out, keeping pets in, and hazing coyotes. He won’t speculate, however, as to what the information will be.